AHH!! This is the moment I've been waiting to blog about for quite some time now and I know you guys are waiting to read all the fun details! Before you dive into the story of us, go grab yourself something sweet to enjoy while you read! I am just so thrilled to be engaged to this man I cannot contain my excitement!! Our story goes way back beyond New York!! As most know, Austin and I met at Disney World (SO CRAZY!!) From that initial meeting, our love continually grew daily! Never in my wildest dreams did I think I would have met my future husband while strolling through Epcot. I never thought Austin would propose in New York! Every time we go on a family vacation he tells me whole-heartedly, "Kristen, I don't want you to be upset at the end of this trip so I'm going to tell you now that I'm NOT proposing while we're on vacation." And everytime I never believed him -- until New York!! He had so many good, believable reasons why he wouldn't propose in New York and I believed them all!! When the moment came I didn't believe he was really proposing, I remember saying, "are you serious?" because I didn't believe it was really happening until I saw the ring in his hand! It's kind of funny because I planned most of the day up until our proposal. 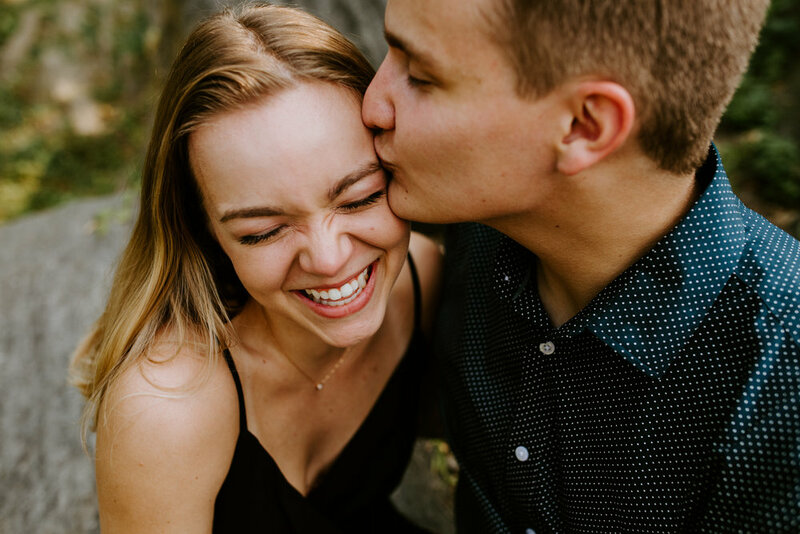 I had booked a couples mini session for us in Central Park. Being a photographer, the idea of having professional portaits of Austin and I taken in New York was a dream come true!! So, I contacted Rachel Rodgers Photography and set the whole thing up. 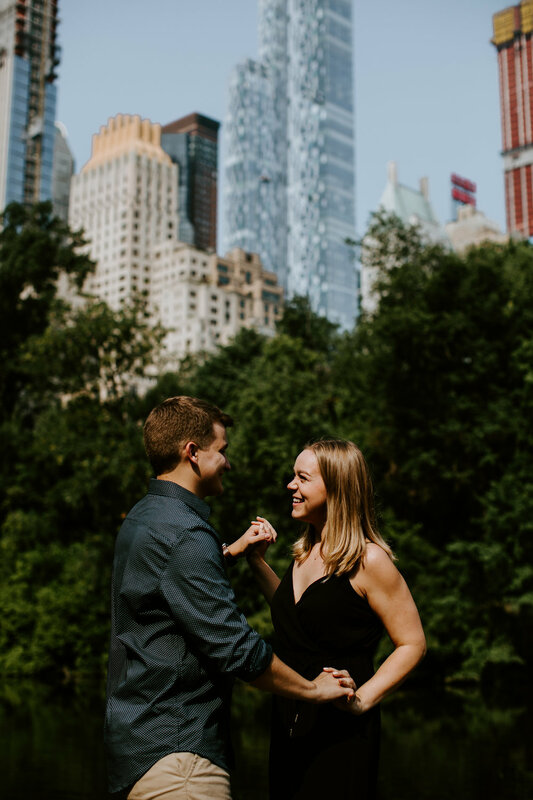 Austin took the perfect opportunity to contact her a month or two before our family trip to New York and tell her that he planned on proposing at the end of the photoshoot on Bow Bridge (a highlight photo spot)! The morning of the photoshoot did not go so well for me, I was upset about my makeup and my clothes and it really ruined my mood. While I was stressing about my looks in the bathroom, Austin was showing my parents the ring and getting excited about the future proposal!! They didn't know the full details of the proposal because Austin did not want anyone to accidentally give away any hints to me that he was going to propose because I usually pick up on the tiniest hints. In fact, the secret was so well kept that my sister, who was at the photoshoot with us, missed the moment. Austin told me the moment he saw my ring he knew that it was the one (which literally gives me all the feels)!!! Side note: I actually put a note on Austin's packing list to pack an engagement ring just being silly and it actually ended up being true!! We walked for around two hours in Central Park. The scenery is amazing, as you can see, but it was not smart of me to wear heels, have my hair done, make up on, or wear a pant suit. It was freaking hot in New York and the sweat was real!!! However, I would do it a thousand times again if everytime it ended in Austin proposing to me! As we were finally approaching Bow Bridge, my feet were acking, I was hot, and ready to be finished with pictures but I had been trecking all through Central Park to find this bridge so I was not going to quit before I made it to my dream destination. As we neared the bridge the sound of a saxiphone playing grew louder and louder signaling that we had made it to our destination!! I was so thrilled and Austin asked if we could go first (remember my sister and her husband were with us getting their pictures taken as well) which I was thrilled to do!! Rachel posed us on the bridge and we began taking our photos. The sound of "Can't Help Falling in Love" playing on the saxiphone. We walked, talked, giggled, and kissed. Austin started to pull away from me while kissing but I just thought he was doing some weird pose, so I went with it. In reality, he was struggling to get the ring out of his pocket!! Once he got it out, he got down on one knee, and asked me to marry him making me the happiest person on the planet!! Have you missed out on the rest of the New York Files?